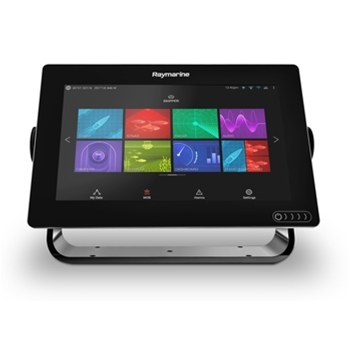 The Axiom 9RV from Raymarine is a top of the line 9” Multi-Function Display with RealVision Sonar and comes packed with an RV-100 Transom Mount Transducer. The included RV transducer will provide CHIRP DownVision, CHIRP SideVision, High Frequency CHIRP and RealVision 3D all in one. Detailed U.S and Canadian Mapping for Coastal and Lake water is also included with Navionics+ Mapping. The Raymarine Axiom 9RV with Navionics+ mapping and RV100 RealVision Transom Mount transducer is a feature packed Chartplotter Fishfinder. Built with a bright 9” touchscreen display and the Lighthouse 3 operating system, the Axiom 9 RV performs flawlessly and is easy to use. The rugged all glass display on your 9 RV makes for a sleek button-less look perfect for flush or surface mounting. The included Navionics+ mapping provides detailed charting right at your fingertips by displaying buoys, mile markers, navaids, depth contours and more for lakes and coastline for the entire United States and Canada. A simplified home screen layout offers bright and bold icons that are easy to access. On any of your navigational or informational pages, you can easily modify, drag, and drop specific data boxes anywhere on your screen. The 9RV Axiom supports a full range of accessories such as Quantum radar, CHIRP Sonar, FLIR thermal cameras, audio integration, instruments, cameras, autopilot and more giving you full access right at your fingertips. Standard Wi-Fi and Bluetooth connectivity allows connection to the latest Raymarine apps for tablets and smartphone use anywhere on the vessel. 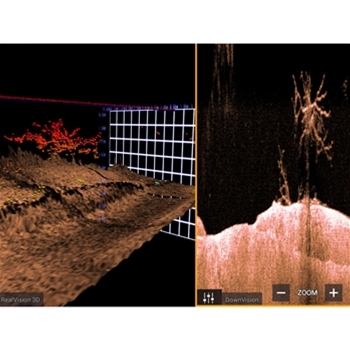 The Axiom 9 RV Sonar/GPS Combo comes packaged with an all-in-one RV-100 Transom Mount Transducer that provides CHIRP Sonar, RealVision 3D, DownVision and SideVision. Also built into the RV100 transducer is an attitude and heading reference system (AHRS) for a much improved sonar image. For the ultimate combination unit, the Raymarine Axiom 9 RV with RV100 is a superb choice for any boater! 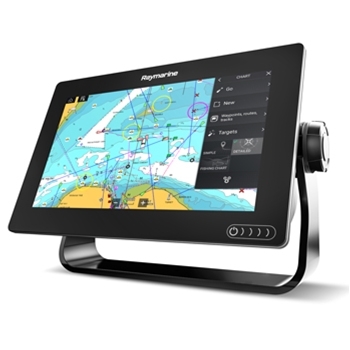 Includes Navionics Plus Mapping and is Compatible with Platinum, C-Map 4D and More! Raymarine A80007 Raynet Network Switch is the central connection point for SeaTalkhs data that uses Raynet connectors. Connect mutliple (up to 5) Raynet devices together with the Raymarine A80007. *This is not compatibe with SeaTalkHS devices with RJ45 Connectors. Raymarine's Raystar 150 10Hz replaces the RS130 and offers a GPS/Glonass Receiver that provides faster performance and enhanced accuracy. SeaTalkNG Compatible and NMEA2000 Certified with optional devicenet adapter. Designed for Simple Surface Mounting. Also Available with Pole Mounting Kit. Select Option Below. The Raymarine HD Digital Color Radome combines the power and clarity of HD signal processing with an ultra-compact radome scanner suitable for all types of vessels. Raymarine’s RD 424HD Radar is a 48 nautical mile HD radar providing the user with an adaptive digital receiver that adjusts to different environmental and sea conditions for a much clearer picture. It also offers “Bird Mode” which automatically optimizes the receiver for detecting sea birds feeding. Raymarine's RMK-10 Remote is a wired keypad that provides full control of Axiom, aSeries, cSeries, eSeries, eS Series and gS Series Multifunction Displays (MFDs) with dedicated keys for Home, Menu, Zoom In/Out, Window Control, Waypoint Management, power/brightness and even Evolution Autopilot Control the RMK10 is available as a Vertical (portrait)Installation only or as a Bundle with both portrait and landscape keypads. Choose Mounting option below. Raymarine 8M Transducer Extension Cable for Raymarine RealVision Transducers.